Take the day off. I insist. 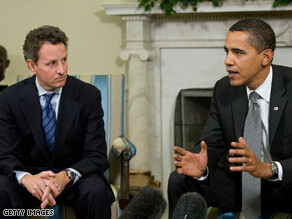 President Obama rebuked Wall Street Thursday during a meeting with new Treasury Secretary Timothy Geithner. From a pancake house to the White House, a glimpse today of what may be required to get us through 2009. President Obama likes to point to the American workers who have cut their hours rather than see their fellow employees lose their jobs. There was a great example this week from Mr. B’s Pancake House in Michigan. The wait staff volunteered to work a shift without pay. It saved their boss $700, a lot of money for a small business during hard times. A recent survey cited by CNN Money showed only one out of five Americans are willing to volunteer reducing their hours. They may not have a choice. California’s Governor Arnold Schwarzenegger has ordered tens of thousands of government workers to take off two days a month without pay. California has to close a $42 billion deficit. Two employee unions challenged the Governor’s order. Today, a Superior Court judge in Sacramento upheld it. From Germany, word that BMW is reducing working hours at its largest manufacturing plant in order to save jobs as car sales slide. Take the day off certainly sounds better than find a new job. This week began with the 70-thousand or so layoffs by seven major companies on “bloody” Monday. The list steadily grows. Yesterday big plane maker Boeing announcing 10,000 job cuts. Today, small plane maker Cessna says it’s cutting 4,000 jobs in Wichita alone. Yesterday Starbucks announced 6,000 jobs will be lost. Today, Kodak announces more than 3,500 job cuts – at least 14 percent of its work force. Those are all big employers. But, as we’re often reminded, it’s small businesses that generate the majority of American jobs. Which is why a story from the Raleigh News & Observer caught my attention. It cites the case of Rush Hour Karting – a place in North Carolina where grownups can have a pizza and race go-karts. (For doubters - The proof is on this YouTube video.) Rush Hour’s 24-year-old cashier told the Raleigh newspaper her job responsibilities have expanded to cleaning the public restrooms at night. “It’s better than shutting down” she says. But employers take note. Management Professor, Ben Rosen, at The University of North Carolina Chapel Hill emphasizes how important it is for management to share the burden of sacrifice. “Even when people are hurt, if they think the policies are fair, they can live with it," says Professor Rosen. "If an employee thinks he's making a sacrifice but the top managers are still going on retreats to Florida in the middle of winter, then it won't seem fair." Which brings me back to CNN headquarters. Here in Atlanta, Mayor Shirley Franklin, like Governor Schwarzenegger, has ordered government workers to take time off, unpaid, every week. She’s reduced the work week of 4,600 city employees to four days – nine hours a day - Fridays off. No choice. A 10 percent reduction in pay. Mayor Franklin is taking the same pay cut herself. And just as I’m writing this blog, at about 4 p.m., here’s President Obama, live on CNN (watch here) sternly lecturing Wall Street executives who we now learn took nearly 20 billion dollars in bonuses in 2008 as many of their companies were asking for government bailouts. President Obama called the Wall Street bonuses “shameful … the height of irresponsibility.” President Obama’s central message: “All of us are gonna have responsibilities to get this economy moving again.” It’s the same point Professor Rosen makes. Message to executives: share the burden. It’s hard to get a handle on how many companies across America are asking its employees to make sacrifices in order to save jobs, and how many executives are sharing in that sacrifice. This CNN Money piece is a great place to start figuring it out. If you work for such a company, please leave a comment and let us know. We’re trying to get a handle on what, in the months to come, could become a way of life in America. Shared sacrifice. Call it President Obama’s Way. Call it Mayor Franklin’s Way. Call it the Mr. B’s Pancake Way or the Rush Hour Go Karting Way. Whatever you call it, for 2009, it seems to be the road ahead. You can only ask so much from the working class--cut your hours to safe your job and your collegiates--spend less--do less--all is good and well--but at the same time--corporate America continues to engage in their greedy business practices--so no matter how much the working class does--corporate America continues to track its profit margins--it all about profits--and when money talks-–the truth always remains hidden-we use to say the have and have nots--–thats changed--it is the have and have more--the have nots are no longer a variable. My company has cut all overtime. There are a lot of people that have been there for thirty years or more that say they have never experienced a complete overtime ban. Most employees there will not make it without the overtime. 90% of the employees are in debt and upside-down on their house & their cars. I suspect some will borrow against their retirement 401k's, but that will only hold the wolf off their front porch for about a year due to the 401k's losing 50% of their values already. I hated to work any overtime so it will not affect me any at all. This economic crisis isn't going away any time soon. The folks who don't want to reduce their hours may be next on the chopping block. It is very hard to get a job now and unemployment payments only last 26 weeks. So half a year from now when unemployment ends and they have no money and no job perhaps they will wonder if their selfishness paid off. I am in management for a large Midwest Home Improvement company. I go home early and take days off so workers under me can stay and work. It is all about payroll dollars available in the day. I cannot afford to lose employees. We will get through this together. I own a business in Kansas and we have ADDED 84 jobs since October of 2008. Our company grew by 39% last year. We assist people with disabilities to move out of hospitals and nursing homes to live in their own home. We save the State of Kansas and the US $10,000 per month per person by assisting people to become independent. This is your Medicaid dollars at work. It's not all about handouts and dependence. Everyone we work with wants to be independent, working and not on state assistance.They only use our services for an average of 2.3 years and are using far fewer services. My concern about the current economy is that services to people with disabilities are cut even further. Did you know that the average person stuck on Social Security Disability only has $720 per month? This must pay for food, clothing, shelter, transportation, medication and a lot of equipment. There is no bailout from being stuck indefinitely on Social Security and in 39 years I am yet to meet anyone who wouldn't rather be working. Only three people in my whole family have jobs currently. How depressing is that? I love Obama but care more about putting food on the table than paving Main St.!!! My brother-in-law had his own construction business and has had no work since around October. The sentence is perfect, unfortunately, not everyone (workers) thinks this way and are so altruistic. Here in Brazil, many companies are taking collective holidays. Collective holidays are leave granted, at the same time, to all employees of a company, or only to employees certain businesses or sectors of a company, regardless of whether they were completed or not the respective periods purchasing. Again, I quote the EDS (now Hewlett-Packard Group) in subsidiary RJ (Brazil) that gave collective holidays to all analysts systems from a single project. Holidays collective aren't a solution to the problem, but a palliative momentary. After all, take the day off certainly sounds better than find a new job. My brother-in-law works for a cabinet manufacturer. If they are forced to take 2 days off per week without pay they can file for unemployment for those lost wages and gain a percentage of that back. Unfortunately, the company has now started cutting their work time by two hours per day and that eliminates the unemployment filing. Do other states have similar unemployment rules? The company I worked for here in our small town simply closed in July, 2008. I worked there for 19 years. Many businesses here are closing and I truly don't know what I'll do when my unemployment runs out. I am unemployed, having been unable to find full time employment since 2002. I've had more than enough days off without pay. I'm at the age and at that point in my career where I rather work part time anyway even if I had a job. I applaud my representatives for voting against the "bailout" legislation. Where is the accountability in this bill? We are handing away money without even discussing what we expect the results to be. What happened to the first round of money, the banks soaked it up like a sponge. This second round was touted as an Infrastructure plan, but allocates less than 15% to construction. Building things and rebuilding things, especially damaged or needed infrastructure is the key to correcting this economic downturn. I believe the construction industry is experiencing the highest unemployment rate right now and this would be the perfect time to rebuild damaged bridges in the north and build the long debated high speed rail systems here in the south. I work in HR for a small firm. We've taken all sorts of measures. We have not been replacing those who have left the company, and in the recent lay offs we had, most everyone save a couple were ones that had performance issues. Then the executives took a pay cut all across the board. Many of us didn't get payraises till today, to be exact, after waiting 18 months, and our pay increases were all minimal across the board. There are grumbles, I won't say there isn't. But it keeps the company afloat, and it keeps all of us in jobs. I work as an adjunct instructor at Santa Barbara City College. The State of California has imposed a 70% budget reduction and I will be working at reduced pay. hey Doug the presidents salary is $400k a year not that anyone with no salary is counting! And yet, Congress gladly accepted their pay raise. And in CA, while the legislature and assembly are still haggling over the budget, IOUs are being issued. Of course, none to those same legislative and assembly members. In the mid-80s when I worked at an electronics company, we went through this same fortnight on/fortnight off, plant shut-downs for a week, etc. We accepted our 10% pay cuts (though you could use your vacation days if you had any left) yet management still had to work those days AND take the pay cut. What is telling about our society is the 4-in-5 who would not willingly reduce their hours. I guess it really is each wo/man for her/himself. First thing Congress should do is repeal the automatic raises they get every year. The way I understand it works is that if they don't vote "NO" on the raise, it happens. This seems a travesty to me – our Washington lawmakers are definitely overpaid for what they do and deliver. In order for our country to "buy into" the idea of freezing/cutting salaries/working less hours or whatever it takes, it needs to start at the TOP. Management has to tighten their belts too, everyday Americans can't do it alone. I am disgusted with the bonuses Wall Street received last year, especially seeing how our financial world went into freefall. None of them should receive a dime in bonuses and they should have to pay back a lot of their salaries. Our government SHOULD NOT release another penny unless and until banks can show where all of it will go. If Main Street makes sacrifices, then Wall Street and everyone in government should make the same sacrifices. Only then will we be able to get this entire mess under control. One of my brothers work for a large car mechanic company in Nashville – they just had their hours reduced. You can work extra hours but you won't be paid for them. One of my other brothers work for a privately held hotel chain – they have cut employees hours, cut out raises for the year, and cut the profit sharing for the year. They say that they hope this will keep them from having to cut people. This is all better than not having a job but the bills don't get cut – so it makes it hard. One cut on bills that I can see is really warranted is the assessed value of houses for property taxes – if they aren't worth as much as they were last year at that assessed value then assessments need to be redone – it is not fair to anyone to pay taxes on a house valued last year at 300K that is only worth 200K this year. How dare the Republicians even voice an opinion on anything. Wasn't it just yesteryear they had a chance to do many things and did nothing? Isn't it under their regime that this all started? Look at the mess we are in, now they know sooooooooooo much. Awful and shameful. This is about us, the American People, and not some silly message to the President about who is in control. They deliberately voted against the Stimulus package. Now it is time those old folkies cut this mess out and help to put this country back in shape. They did not win anything and nothing should go their way, it should be about the best way. That old mentality has to go, we are their bosses and i say they are the cause of this dillema we are in and they need to grow up and do what is right. Do you think he should take a reduction from his 200k/yr? We have "Daily Release Time" and "Monthly Release Time"; you may take off a day without pay or the whole month off without pay. It's totally voluntary, and many people take advantage of it without the company forcing employees to do so. It's a win-win situation; employees who want to work overtime can take up the workload left by the employees enjoying their "release time." We have a pretty large work group, and have not had to layoff. I work for a profitable airline. Has Obama taken a pay cut? I work in the office of a construction company. Since the beginning of December 2008 I have been working only 20 hrs a week. I would rather take the cut in hours and keep my job that I have had for 5 years than to try to find another job that offers the same salary & benefits.